Tabbang is a facebook application which allows any individuals, businesses, and groups to customize & publish stunning facebook fanpages. No need for any kind of programming or designing skill. Tabbang is free to use and build !! 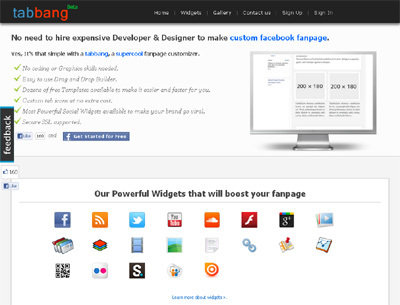 We’ve dozens of powerful widgets from the most powerful social platforms. • No need to hire expensive Developers & Designers. • Easy to use and build, just Drag and Drop everyting!! • We’ve got the most powerful widgets from the most powerful social platforms such as facebook, twitter, youtube, google plus and many more. • We’ve got bunch of professional templates to make it fast and easy for user. • We’ve got some special widgets for businesses to promote and engage fans.